Treasury is looking for a syndicated loan to pay off the Sh77.25 billion (another previously syndicated) loan taken in 2015 that’s due next year (2019). The debt the country is hoping to clear with this syndicated loan is one which nobody knows what it was spent on. Actually, that’s the nature of the syndicated loans. Banking experts will tell you a syndicated loan, among other things doesn’t require the public be informed on the details. That explains why such loans are extraordinarily expensive because; the secrecy and the fact that it is availed quite quickly without any need for disclosure of the projects or whatever it is going to be spent on makes it all the more expensive. It’s not just the loans that the government is not willing to be accountable to its people on; even the grants they’re getting are shrouded in secrecy. A few days ago, Tinderet MP, Alex Kosgey expressed his frustrations with Treasury after it appeared apparent the government wasn’t going to divulge the deal that saw European Union (EU) give loans and grants amounting to Sh520 billion to Kenya. He lamented that Treasury won’t even say how much was the loan and how much was the grant. The contempt the government has for the great people of this republic is mindboggling. Firstly, the Office of the Auditor General came under scathing attack following his revelations that the 2014 Eurobond couldn’t be accounted for. And as if that wasn’t enough, the government goes for a syndicated loan that doesn’t require they divulge details. President Kibaki under the Grand Coalition government managed to bring down the government debt to GDP in 2012 to 38.2% an all-time low but the Jubilee government has managed to reverse this in the 6 years it has been in office, with a 57.1% debt to GDP in 2017. This data is according to the Trading Economics site. Never mind the International Monetary Fund (IMF) recommends that ratios of public debt to GDP should not be higher than 40% for developing countries. One of the strange phenomena that indirectly leads to this borrowing craze that can’t be accounted for is that whenever the budget is read, MPs hardly interrogate it in light of the previous budget and particularly stalled development projects. The result therefore is a situation where, new projects are started while previously initiated projects have stalled having gobbled up a substantial amount of the budget with no form of accountability. In fact in July 2018, MPs were divided over the President’s directive to government accounting officers whom he warned against sanctioning new projects without completing those that are ongoing. Majority opposed to the directive complained that their areas would suffer at the expense of previously launched projects in other constituencies. They weren’t concerned about the national debt or whether the monies were being used prudently. They wanted something visible in their constituencies to guarantee their election in 2022. National Assembly watchdog committee wants the IEBC commissioners who resigned to appear before them to clarify issues relating to irregular tenders that the chairman has since blamed on the former CEO, Ezra Chiloba. Chairman. Chebukati told the Public Accounts Committee (PAC) that the commissioners resigned in protest because they were digging deeper into the alleged corruption and the decision to discipline the CEO didn’t sit well with them. The MPs also heard that the commissioners were kept in the dark in the more than 100 contracts issued by the secretariat headed by the CEO. Senate a Den of Corruption? A number of Senators who voted to adopt the Ruaraka Land report by the Public Accounts Committee (PAC) now accuse their colleagues of being influenced to defeat the report. Senate Minority leader, James Orengo, Chairman of the Public Accounts Committee, Moses Kajwang, Narok Senator, Ledama Olekina, Boniface Kabaka (Machakos) and Johnes Mwaruma (Taita-Taveta) want the Ethics and Anti-Corruption Commission (EACC) to take up the matter saying it was a setback on the ongoing fight against corruption. Machakos Senator allegedly claimed the Senate was a den of corruption and regrets being a member of such a House. Nairobi Senator, Johnson Sakaja was the only Jubilee Senator who voted to adopt the report. 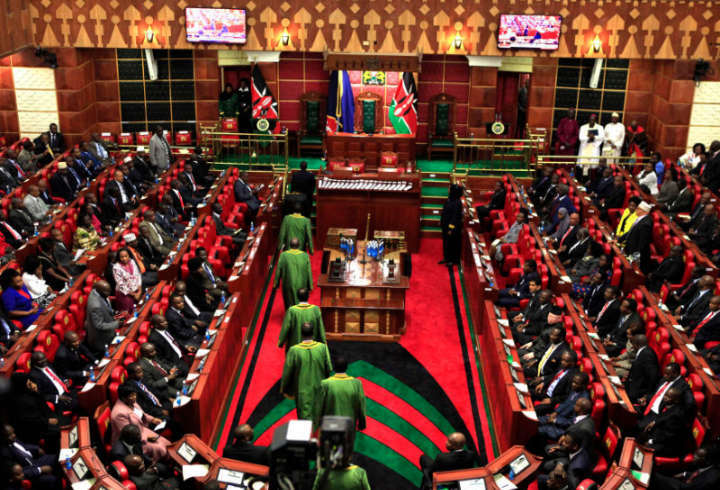 MPs now want the Directorate of Criminial Investigation (DCI), Ethics and Anti-Corruption Commission (EACC) to investigate only those MPs who claimed they were bribed to shoot down the sugar report and not the entire House. The MPs while adopting the report by the Powers and Privileges Committee expressed worry that the investigations could drag to 2022 and some MPs could fail to get clearance to vie for their seats. The bribery report however, doesn’t give any clarity on who was bribed or who received the bribe but asks the investigating agencies to investigate further. Judges have now joined MPs in pushing for higher pay, something the Salaries and Remuneration Commission (SRC) had warned was likely to happen while criticizing the Parliamentary Service Bill, 2018 that sought to review MPs allowances and benefits. The MPs defiantly went ahead to debate the Bill accusing the media of misleading the public on the Bill. Judges who left private practice to join the bench are now jostling to challenge the SRC advice that the Judicial Service Commission (JSC) operates by to ensure they're paid at per with their colleagues promoted from within the judiciary. At the moment, the latter earn more than the former. At least 20 sitting High Court Judges who left private practice to join the bench have filed a constitutional petition seeking to harmonize entry packages for all judges. "Mr. Temporary Deputy Speaker, Sir, our lecturers' remuneration is unbelievable compared to what their equals in other countries get. Even within the country, a lecturer or a professor who leaves the University of Nairobi and goes to USIU gets much more money." Sentiments by former Muhoroni MP, Hon.(Prof). Ayiecho Olweny when debating the motion strike crisis in public universities on November 2, 2006. Igembe South MP John Paul Mwirigi made headlines this week after he was arrested for allegedly attempting to forcibly remove a police roadblock at Kiguchwa market. The first time MP who allegedly blocked a road to protest the ongoing crack down on faulty matatus was held at Mikinduri police station in Tigania East Meru County. The Area Police boss complained the MP had come all the way from his constituency in Igembe South to lead a protest in Tigania East, "to disturb them". His counterparts from Imenti North, Imenti Central and EALA MP, Mpuru Aburi appeared to support him saying the police together with the National Transport and Safety Authority (NTSA) were harassing Probox drivers. Area Chief also accused MP Mwirigi of inciting non-compliant vehicles to get back on the road.